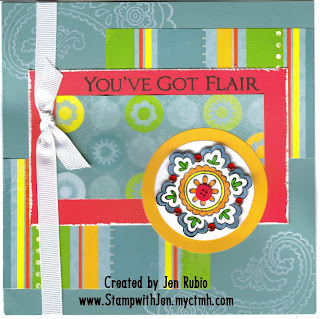 Welcome to stop #11 on our July Stamp of the Month Blog Hop!! I am excited to be participating with 42 other Close to my Heart Independent Consultants this time around! This blog hop is our way of sharing with you a large variety of different artwork ideas using this month's SOTM - You've Got Flair! I'm sharing a 6x6 card (bottom) and it's miniature companion version - a 3 x 4.75" card (top). 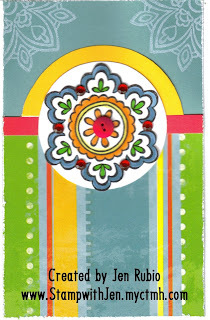 The card designs are inspired by Wishes - Keyhole (p. 12) and Wishes - Pieced Together (p. 34). I created both cards using our bold and bright Tinkerin' papers (the colors used include Black, Clover Meadow, Holiday Red, Sunflower, Sunny Yellow, Twilight, and White Daisy). The daisy-looking stamp was stamped with archival black ink and colored in with our exclusive inks markers, then I cut out the designs, embellished them with Holiday Red Sparkles and a button, and adhered them to the cards with 3-D mounting tape. I especially like the added detail the background stamping with White Daisy ink on Twilight cardstock adds to my creations - such a simple touch - but a little white detailing seems to add a more finished look. I hope my creations have inspired you at least a little! THANK YOU for hopping with us and please enjoy your journey!! !